Mount your favorite 1-piece light bar with this bracket kit from Roadworks! 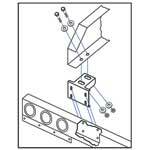 Comes in either below frame or side frame kits with all needed hardware included. Sold as a kit.